A few days ago, Marilyn Reed, the wife of Jazz Drummer, Kenny Reed, asked me if I have contributed any of our memories to the West Los Angeles Sawtelle Neighborhood Council. I told her it was close to three years since my last research. Today, I hit pay dirt when I googled the New Balladeer. Information is added all the time. I found a venue for the Balladeer, and a small posterette, which may constitute a first. There was a Jazz jam. I went to the New Balladeer with Bryan Maclean, of the group, Love. I had my first art show here. I am pretty sure I heard John Fehey, and Ry Cooder, because I bought a guitar and played like them. Bryan taught me some chords, showed me how use a slide, and I did a lot of improvising. If not for my desire to be a famous artist, I might have ended up in a rock band. However, I am a terrible singer. That mattered, then. Marilyn and I found a tea house here, before it became the Balladeer. We made it our Bohemian hideaway where we went after school. We attended University High School that was six blocks away. I did a drawing of my first flame sitting by the fire, sipping tea. Morgan Cavett became the manager of the New Balladeer in April of 64. Bryan and I dropped out of High School and went here in 1963 when we were seventeen. I went to the Dwan gallery in Westwood, and was doing a lot of experimenting with styles. Two members of the Byrds played here. I believe they got started here, and not at the Troubadour, which was a Folk Club on Santa Monica. I doubt the Balladeer name was changed to Troubadour. That would have caused a problem. Marilyn had introduced me to her good friend, Les McCann. Her sister lived with his drummer, Ron Jefferson. Shaunna co-wrote a biography about Fela that was sold to the producers that have a hit on off Broadway. Rising Sons, and Love, were interracial bands. Kenny Reed’s Jazz band, Stone Cold Jazz, is interracial, as is his marriage. Marilyn fell in love with from afar. Later she saw the bust I was doing of Cindy, her muse since the second grade. Marilyn grew up in a interracial Filipino family in the Sawtelle. She has all the memories that are sorely needed in developing a cultural identity. My sister (who dated Bryan) followed in my footsteps, and became the world famous artist ‘Rosamond’. Bryan was an artist, and the three of us attended the LA Cienega Monday Art Walk. At sixteen and seventeen the world was our oyster. Bryan could not go with the Byrds to Europe because he was not an adult. A watercolor I did at sixteen toured the world. What I suggest is UCLA turn its thrift store into a Folk Music School with Bohemian Boutique and coffee house. 1566 Sawtelle needs to be declared a Historic Monument. I see Massachusetts Avenue being closed off for a Folk, and Folk-Rock Festival. How about the ‘Eight Mile High Festival’. This may be where it all began. This is – Genesis! What song should lead off the festivities? The Bohemian Balladeer and Boutique can raise funds for the charity now supported by the Thrift Store, that perhaps can be relocated near by? Can the UCLA School of Music help with the funding? Bryan started playing guitar professionally in 1963. He got a job at the Balladeer in West Hollywood playing folk and blues guitar. The following year, the club changed its name to the Troubadour. His regular set routine was a mixture between Appalachian folk songs and delta blues, and he also frequently covered Robert Johnson’s “Cross Road Blues.” It was there he met the founding musicians of The Byrds, Gene Clark and Jim McGuinn, when they were rehearsing as a duo. Bryan became good friends with David Crosby. During that time, Bryan also became friends with songwriter Sharon Sheeley, who fixed him up on his first date with singer Jackie De Shannon. With MacLean as equipment manager, the Byrds went on the road to promote their first single “Mr. Tambourine Man.” By the time the Byrds left for their first UK tour, MacLean was left behind and very disappointed. In 1964 he moved to Santa Monica, California, and formed Rising Sons with fellow blues rock musician Ry Cooder and Jessie Lee Kincaid, landing a record deal with Columbia Records soon after. The group was one of the first interracial bands of the period, which likely made them commercially unviable. An album was never released (though a single was) and the band soon broke up, though Legacy Records did release The Rising Sons Featuring Taj Mahal and Ry Cooder in 1993 with material from that period. During this time Mahal was working with others, musicians like Howlin’ Wolf, Buddy Guy, Lightnin’ Hopkins, and Muddy Waters. The Womenfolk were an American folk band from Los Angeles, California. The Womenfolk were active from 1963 to 1966 and were signed to RCA Records during the folk revival boom of the 1960s. They released several albums, the most successful of which was their self-titled 1964 effort, which reached #118 on the Billboard 200. The Womenfolk’s version of “Little Boxes” was their only hit single, peaking at #83 in April 1964. It was at the time the shortest record (1:03) to make the Billboard Hot 100. Morgan Cavett, a fifteen year resident of Pinon Hills, died of cancer, peacefully in his sleep, on Thursday, December 9, 2004. He was a music and film producer, a newspaper writer for the Mountaineer Progress and funny man who made people laugh. He was 60 years old. Morgan was born into the Hollywood home of Frank and Mary Cavett. Morgan’s father Frank won screenwriting Oscars for “Going My Way” and “The Greatest Show on Earth.” Morgan’s mother, Mary Oakes Cavett was a famous Vogue fashion model. Morgan grew up hanging around famous personalities such as Ava Gardner, Artie Shaw and Dorothy Parker. In the early 1960s, Morgan made inroads into the music business by managing the New Balladeer coffeehouse. Here he met John Kay of Steppenwolf and other singers, songwriters and musicians who become lifetime friends and professional colleagues. He went on to produce records with Johnny Mercer and became a successful producer in his own right discovering the 1970s duo sensation The Captain and Tennille. From 1977-1988 Morgan and his partner, Bruce Langhorne, owned Blue Dolphin Recording Studios where they wrote the soundtracks for “Melvin and Howard,” “Swing Shift” and other feature films. In 1990 Morgan and his wife Mary settled in Pinon Hills and Morgan became active in the community. He and Yvonne Barton helped spearhead a group of high desert residents who successfully opposed the development of a large strip mine in Llano. In 1993 he began writing a column for the Mountaineer Progress entitled “Around Town” in which he featured Tri-Community residents and he also joined the Mountaineer Progress Staff as a part-time reporter. In 1994 Morgan served as president of the Pinon Hills Chamber of Commerce. He did all this while running a successful video documentary production company specializing in creative artists and historical figures. Morgan is survived by his wife Mary of Pinon Hills and his daughter Christina of Ukiah, California. On August 22, 1992, the 99th anniversary of Parker’s birth, the United States Postal Service issued a 29¢ U.S. commemorative postage stamp in the Literary Arts series. The Algonquin Round Table, as well as the number of other literary and theatrical greats who lodged at the hotel, contributed to the Algonquin Hotel being designated in 1987 as a New York City Historic Landmark. In 1996, the hotel was designated as a National Literary Landmark by the Friends of Libraries USA, based on the contributions of Parker and other members of the Round Table. The organization’s bronze plaque is attached to the front of the hotel. 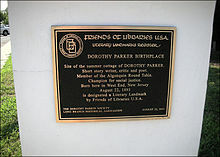 Parker’s birthplace at the Jersey Shore was also designated a National Literary Landmark by Friends of Libraries USA in 2005 and a bronze plaque marks the former site of her family house.